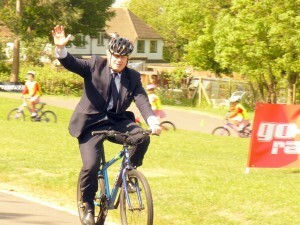 Boris Johnson rode into Field End School this morning to see the circuit that has been laid out for the children to ride. He met with Brian Wright, who has been one of our members who help to design the course and who coaches the children in cycling skills each week. 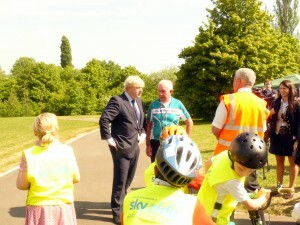 Boris rode round the circuit several times accompanied by the school children and Ray Kelly and Mike Ellison all wearing their Willesden kit.